Something my boyfriend and I have been doing for the past couple months is cooking together, and cooking healthy meals together. Lets face it when you decide to eat healthy, it can be difficult. If you have a significant other or friend who is in the same boat as you, its nice to do it together. You support each other and you can have a lot of fun cooking together, shopping together and finding new recipes together. I had every intention of posting this a few weeks ago, but I thought I would save it for Valentine's Day week so other couples can have some ideas on what to do or what to cook for Valentine's Day. Granted, this meal isn't very romantic, but I wanted to put it out there that you don't have to do crazy expensive things for Valentine's Day. As much as I love Valentine's Day I do feel like there is a pressure on couples to spend a ton of money. Cooking at home with my man is my ideal night and you can do that for Valentine's Day. Considering Valentine's Day is one of the busiest restaurant days, staying in a comfortable setting and cooking together is great. Pop open a bottle of wine, relax in a bubble bath together, watch a romantic movie, or jump in the hot tub. Although I do love to be spoiled once and a while, a relaxing night in is sometimes all you need. I think another thing people initially assume when it comes to cooking, is that its too much work or they don't know how to cook. My boyfriend and I are pretty clueless with cooking, but with this meal it was simple. Pick up two pieces of salmon, spice the top with some salt and pepper. Throw it on the pan, let them cook for about 5 minutes on each side (give or take). Buy some peppers, cut them in thin slices, then sauté them in a pan until soft. Buy some sweet potatoes, cut them up in whatever shape you prefer. Toss a bit of virgin olive oil and seasoning salt on top and throw them in the oven until crispy. 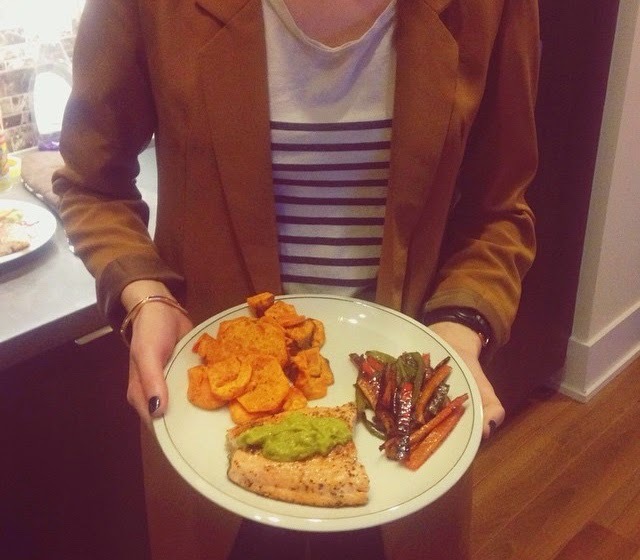 Toss some avocado on top of the sweet potatoes or fish and you are finished. Simple, and its a fun thing to do with your lover. wow~~~ It is so beautiful in its look. It must taste good. It makes my mouth water.